We have safely landed almost smack dab in the middle of Texas for a couple of days. 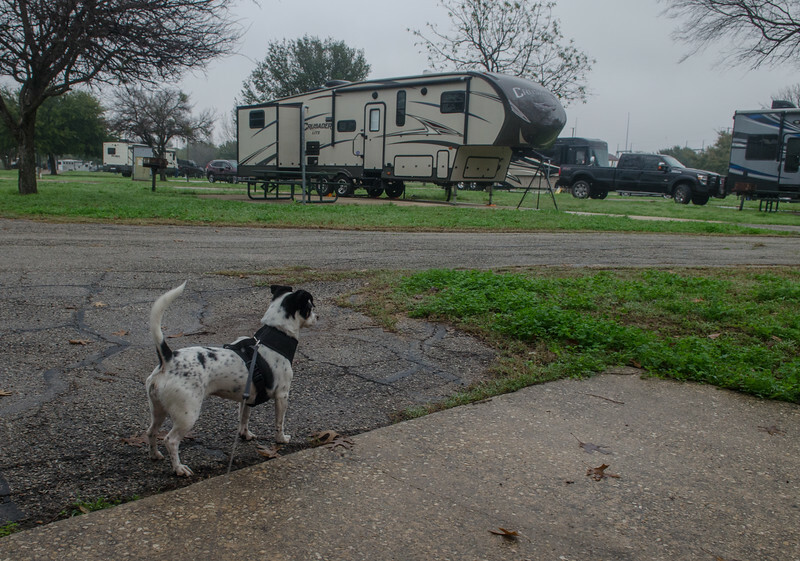 JBSA Sam Houston RV Park is delightful. 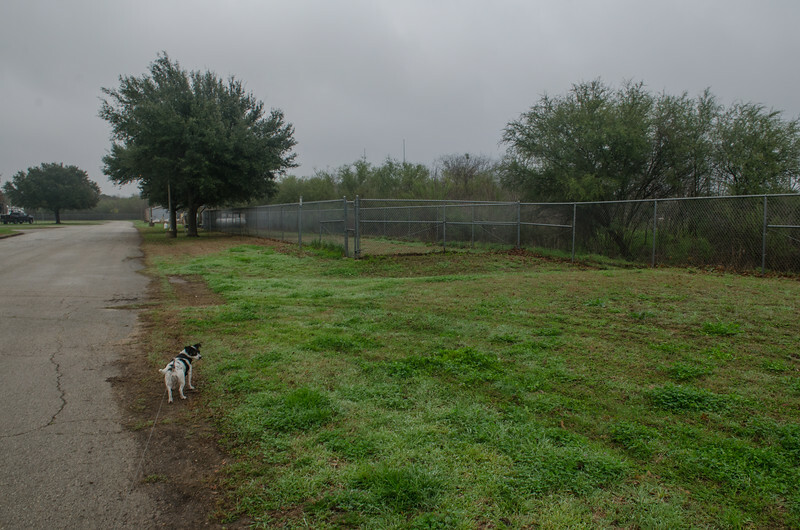 Wide open spaces, green grass, level sites, with large patios and picnic tables. The rain held off until we arrived at the park and as we checked in big fat drops landed on the windshield. Lucky for us we had nowhere to go last night. Especially since the Verizon Hot Spot on my phone decided to work after all. Things get a bit weird when the internet acts up. Especially when we chose this location as a place where we could catch up on bookwork and banking. That stuff just doesn’t go away because we are traveling. Deb is handling the mail, but it is tax season, and she is sending pdf’s of some items to us, and we are talking on the phone and discussing which hard copies might need to be forwarded to a location in Florida when we get there. My phone had 5 bars and 4G so I couldn’t figure out why it kept saying “data connection not available”. It certainly didn’t help my mood when I texted Daughter Deanna and she said she has had trouble with her hot spot as well. Ack!! What to do? Go find a Starbucks? I can’t believe how dependent we are on the internet, especially since we have arranged to have most everything handled electronically. Then for no reason whatsoever, I tried one more time and the connections lit up nice as you please. 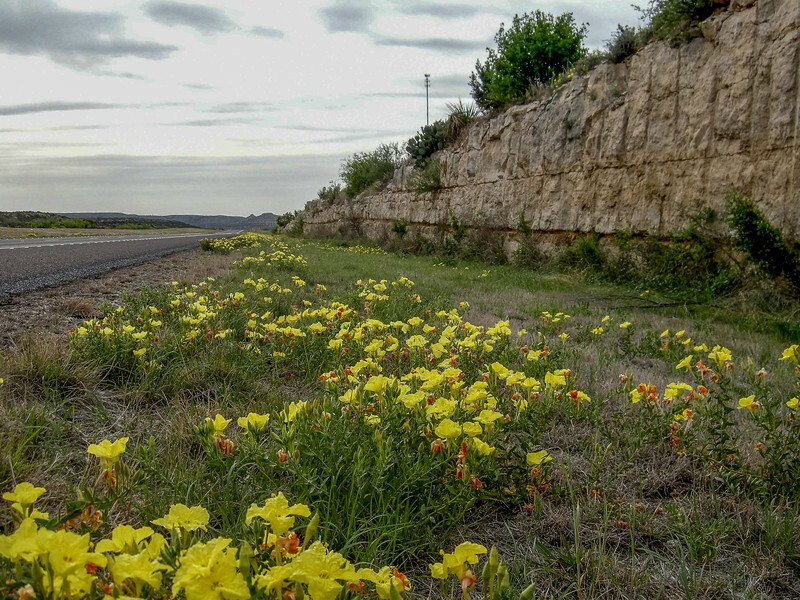 The drive yesterday started off beautifully, with a high cloud cover and a bit of light coming from the east as we left Fort Stockton. I somehow missed the unmarked onramp to the freeway and ended up on a frontage road that ended ignominiously in a pile of dirt and a fence. Lucky there was a turnaround and I only went a mile or two out of my way. Another not so rosy development, for the second time on this trip, the battery in the tracker went dead. Not a big problem, because we can start it up with the MoHo. Only problem is trying to find a wide enough place along the interstate to get everything turned around properly. Still aren’t sure exactly what the problem is but we are working on eliminating possibilities. 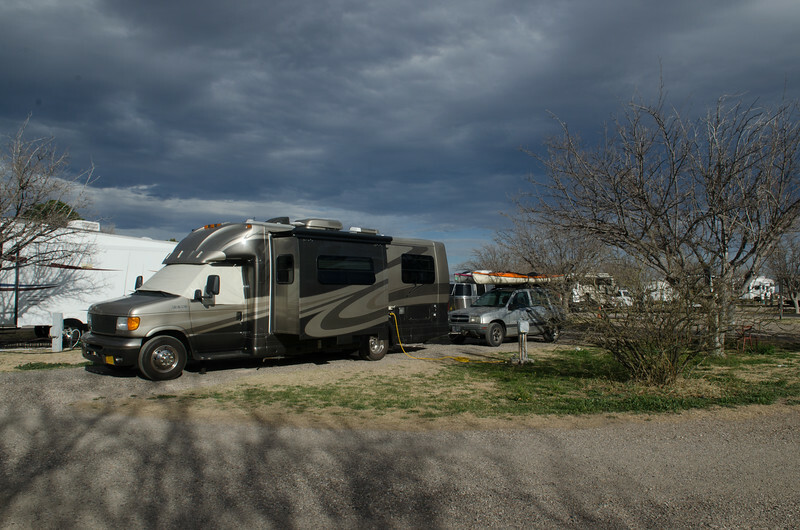 We stopped in the little town of Sonora and started up the Tracker and Mo drove it for an hour eastward to Junction where we hooked up once again and continued on our way. When we arrived in San Antonio, all seemed good. Let’s hope it stays that way. The other not so rosy little thing yesterday was many miles and a couple of hours of dull, gray fog. I have no idea how there is fog in the middle of this dry landscape, since there isn’t a lake or ocean for a few hundred miles at least. But foggy it was. Sometimes thick, sometimes thinning a bit, but all the time gray and dull. When the fog did clear a bit, we realized that the landscape was also gray. The grasses aren’t really yellow, but more like a dull gray brown. The entire day seemed to be different versions of gray, brown, and dark dull olive green. 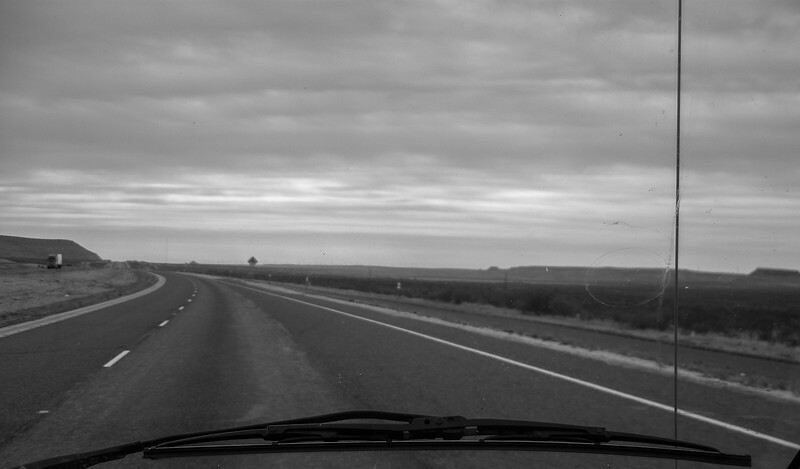 The drive wasn’t too bad at all, and we got to San Antonio in about 6 hours, in spite of the extra stops. However, I remembered well the maze of overpasses and freeway interchanges that are throughout the city from the times I visited my daughter when she lived here. We were prepared. Mo was driving, I was navigating, with two websites open, google maps and the military camp website which had a full page of complex directions for getting through town, onto the base, and finally at the campground. It was stressful, but not horrible, and traffic flowed along nicely in spite of the interchanges and construction. We were both incredibly grateful when we arrived at the park, and were greeted by “Baker”. I have spoken with Baker a few times on the phone, and she is just delightful. She offered so much help and information to us about getting around, and gave us several maps with directions to get downtown and avoiding the worst of the traffic. As soon as we settled in, after finally getting the internet to work, I checked out the showers and got a couple of loads of laundry going. The machines were clean, worked great and at a buck fifty each were a reasonable price. The showers look OK, but I will wear my rubber shoes since I’m not so sure about the floors. Still, this is a very nice park once you find it, and we are looking forward to our down time here. Our big exciting outing will be to go downtown today to the Mercado, where we plan to dine at one of our favorite Mexican restaurants of all time. More about that later! Mattie was excited to head for the dog park this morning. She was also excited to go back home. Of course, looking at the weather hasn’t been particularly encouraging. After really gorgeous skies and sunshine in the southwest, it seems we will now be dogged by rain, clouds and fog for at least the next two weeks. It is supposed to be raining when we get to Louisiana, raining for the two days we will spend at Keesler AFB in Biloxi, and sadly, raining for the first few days of our visit to the gorgeous barrier islands of Saint Vincent, St Joe Peninsula, and Saint Marks. I am not quite sure how our kayaking plans will fit in with all the predictions of rain. All I can do is hope and pray that it lets up eventually, and sooner or later we will get a taste of why we are going to Florida. We had read about trains at this park, and they were around, but not really intrusive. We actually slept really well with outside temps in the 60’s and rain on the roof. Sleeping in till 8AM is a rare thing for us. It was nice. Today should be an easy day with the fog predicted to lift before noon and the afternoon showers to be light. 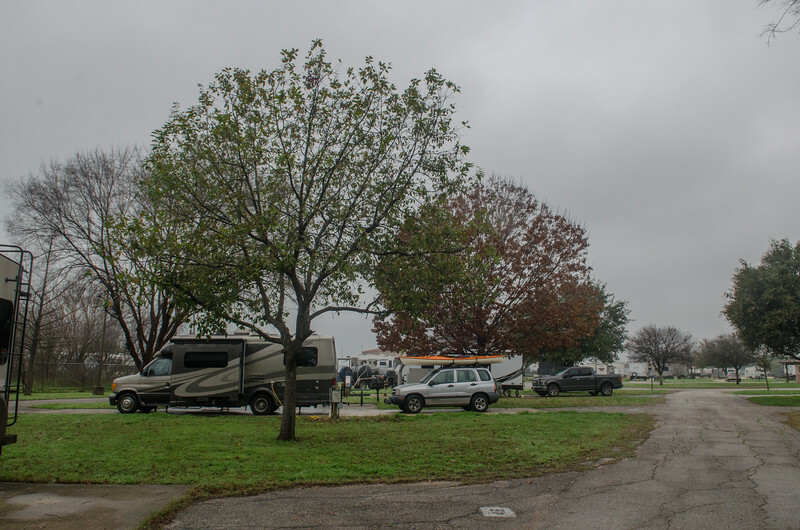 I think it's great that military bases often have campgrounds that are available to retirees. Nice to have some down time there for a few days, get caught up and relax a bit, Too bad about the weather though. Well, as we all know who travel or live in an RV, weather is a given. It will be good or maybe not, but no matter. Either way it is a story. I hope the problem with your tode works itself out OK. As for the weather well it sounds like the weather here in Tucson since Sat. and for the rest of the week. Enjoy your favorite place to eat. I think we may have figured it out. So far so good, Jo, and thanks. I honestly think Verizon just screws with us sometimes. Glad you're back in good graces. Driving through, around, or into cities is something I try to avoid. Especially traveling alone. Pre-cell phone/internet I posted a note on the dashboard with all my turns and exits. Have fun. I hear San Antonio is a fun town to play in. So very true, and we have enjoyed many parts of Texas, however this time we are just getting to Florida. Ugh, the weather. We've been in thick, heavy fog at Davis Bayou in the National Seashore for the past three days. I hope we'll all have some better weather soon in Florida. Are we both headed for the Hidden Coast? We will be at Indian Pass in 3 days. I read your post about the comihng year, it was amazing that so many friends chimed in wishing you well. Was trying to read the comments and finally gave up. Hope to run into you soon. Yeah ... dependence on the internet and how much it has grown in leaps and bounds with the advent of e-devices is something else. I am very paper-averse, so it really puts me out of sorts when I can’t get what I need due to low- or no-signal. It’s great when you have it ... a pain when you don’t. Still, I look around and realize that I am not as dependent as so many others around me who can’t but their devices down for even a minute or two ... or have to sleep with it within arm’s length ... our devices stay in the living room. Our CR-V generally has a dead battery when we return after storing it for months while we’re in Europe. After the first time trying to maneuver things around to be able to jump it with the rig, Mui bought an extra long jumper cable ... turned out to be a good thing as last year we ended up using it to jump the rig from the CR-V without having to unhook it when the Phaeton refused to start up. Baker is an institution ... and she seems to always remember Mui when he calls for reservations. So helpful too with her inside knowledge. We always enjoy our stays at JBSA. We haven't had a problem lately, but have decided that when we are parked at night and still hoooked up, we sill take out the key for the night. So far So good. So interesting about Baker, I noticed on the family camp military website that she is mentioned often in the comments.